You’re probably watching the weather and the forecast may be telling you it will be clear and sunny. You have no reason to expect you’ll have any need for your rain gear on this trip, right? Well, you may want to pack at least some of it – just in case. Weather can be fickle and storms can show up when we least expect them. You can be planning a trip that is several days long and are having so much fun that you just aren’t concerned with listening to weather reports so you could get caught unaware of an oncoming thunderstorm. Even if you don’t experience a full-on rain there can be light afternoon sprinkles or heavy morning dew. Tarp – Or two. You’ll use these over and under things when needed. Raincoats – For each member of the family. 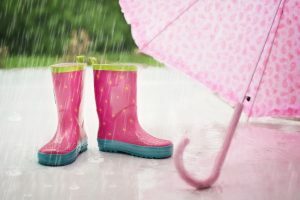 Waterproof Footwear – Flip Flops, goulashes, etc. Rain Hats – If your coats are not hooded. You may want to pack one bag with all of these items and then just leave it in the car until and if you need it. You just never know what will happen with old Mother Nature so wouldn’t you rather be prepared? We want you little family of campers to be happy ones and not damp and grumpy ones so this little tip might just help make that happen. We can’t wait to see you this summer so be sure to make your reservation as soon as you know your camping days. We’ll be seeing you soon!